Low power consumption tube heater with thermostat control that creates warm air circulation to help prevent condensation, dampness, mould and mildew. 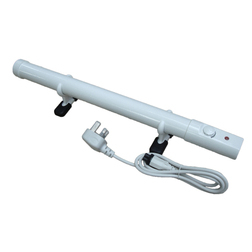 This boat tube heater is a low power consumption mains powered tube heater with thermostat control that creates warm air circulation to help prevent condensation, dampness, mould and mildew, ideal for use while your boat is in storage during the winter. It is finished with a white enamel surface and is water resistant to IP44, it features a rotary thermostat control knob for different temperature settings and 1.5m of power cable with a 3-pin UK mains plug. The tube heater comes complete with both floor and wall mounting brackets, it must always be installed horizontally, however the brackets allow for the removal of the tube heater without removing the brackets from the wall.